According to a recent research report by Transparency Market Research (TMR), the global bonded magnets market is led by leading players such as Allstar Magnetics, Arnold Magnetic Technologies, Neo Magnequench, Alliance LLC, and Viona Magnetics, etc. Market players are operating with intense focus on the integration from raw material supply to manufacturing process, so as to bring about a reduction in the cost of production. Leading players within the market are also vying to boost their product portfolio so as to meet the newer demands from distinct end use industries. 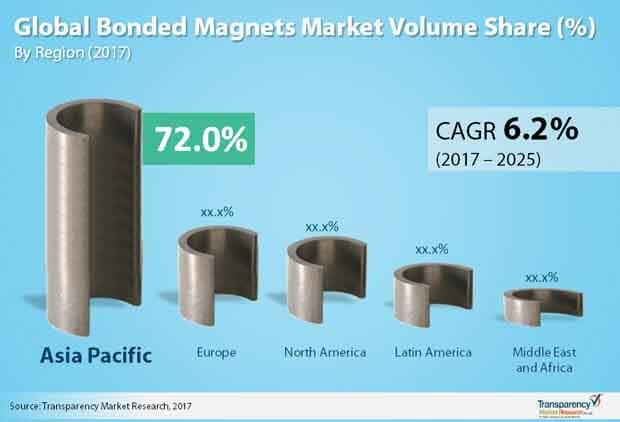 According to Transparency Market Research, the global bonded magnets market will expand at a 7% CAGR between 2017 and 2025 and reach an evaluation of US$2.5 bn by 2025. On the basis of application, the electric and electronics segment is leading both in terms of Revenue and volume. The high demand for hand tool motors, cameras, refrigerator door seals, frictionless bearings, fan motors, gaskets, clocks, and watches is boosting the growth of the electrical and electronic segment. The flourishing automotive sector is also a key application area for bonded magnets period in the automotive sector, bonded magnets are used in the motors for vipers, wheel speed sensors, power windows, crash sensors, wheel speed sensors, crash sensors, sound-deadening panels, chassis height sensor, tachometer, ignition magnets, fuel gauges, and speedometers. On the basis of geography, Asia Pacific is witnessing the highest demand for bonded magnet, with China being in the forefront. As South Korea and Japan at a production base for Semiconductor chips and storage devices on hard disk and similar. The product, the demand for bonded magnet is high from these two countries as well. Asia Pacific not only produces but also exports huge amounts of bonded magnets to other regions in the world on account of the height of a lability of raw materials such as rare earth metal, availability of cheap labour, and advanced technologies. One of the key factors revolutionising the bonded magnets market is additive manufacturing or 3D printing which has changed the production method of the bonded magnets and it is now possible to form complex shapes of both thermoset and thermoplastic bonded magnets with minimal wastage of material and at a reasonable cost. The market is significantly benefitting from the trend of miniaturization. The growing demand for miniaturization of various automotive parts such as sensors and electronic systems will create a heightened demand for bonded magnets. The growing need for boosting performance efficiency in the automotive sector is also behind the high demand for bonded magnets.